All the Sports Nursery Theme Ideas, Decor and Bedding You Need to Create a One of a Kind Sports Nursery for Your Little All Star. 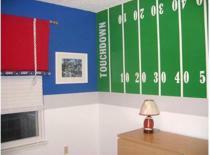 Bring back the glory days by decorating your little one's room in your favorite sports theme. Whether you choose to go with a general sports theme, a particular sport that brings back memories of younger days or a much loved favorite team, a sports theme nursery is one that will grow with your little one for years to come. What a great way to share stories of the past with your own little star. From vintage to cartoon, there are plenty of fun and playful ways to bring the excitement of sports to your baby's special space! You'll also find a whole ball park of sports nursery theme ideas in the wide range of sports theme nursery decor available on the market. From vintage baseball posters to drawer pulls painted to look like soccer balls, you'll find everything you need to decorate your sports theme baby nursery room at our Sports Theme Nursery Decor Store. Or visit the Sports theme section at ababy.com. 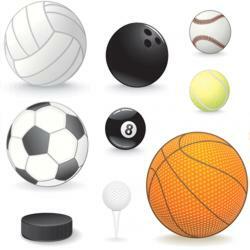 You'll find plenty of mix and match sports theme decor all in one place. Furniture, bedding, lighting, rugs and more. 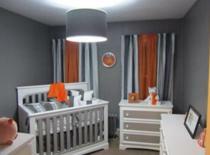 Everything you need to hit the ball out of the park with a great nursery design! Click here to go to the ababy.com Sports theme section. 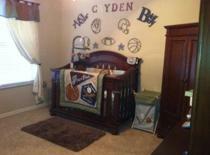 If you are decorating a sports theme nursery enter it in our baby nursery photos contest here. You could win a great prize and we will add your nursery to this page to inspire other moms! If you're going for a vintage feel, stick to whites, creams and caramels with splashes of burgundy or blue. If you want to include lots of sport memorabilia, a sports field palette of green and beige makes a great background. A great way to choose your colors is to use your favorite team's logo as a starting point. Team caps, shirts and flags. You can decide to go with a general all star sports theme or concentrate on one sport or a favorite team. 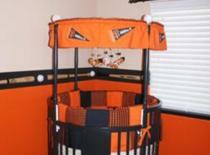 A vintage sports nursery is really effective and easy to create. Include old battered mitts, bats and balls and vintage posters of famous players. Put old baseball card sets and other collectibles on display. If you want to go for a cartoon type sports nursery, you can base your theme on Snoopy and Charlie Brown heading out to the ball game. There are plenty of Snoopy crib bedding sets that are just perfect for this nursery decorating idea. Mickey Mouse and Goofy also make great sporting pals! A few famous players or players from your favorite team. A view of the spectators in the stands. A baseball or football pitch or a hockey ice rink. A player's locker with shirts hanging inside and a bat or hockey stick standing at the bottom. Bats, mitts and balls lying in the grass or bouncing through the air. Packets of popcorn, peanuts and hotdogs. 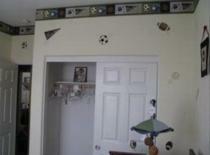 If you don't want to paint you can jazz up your baby nursery easily by using sports theme wall decals instead. 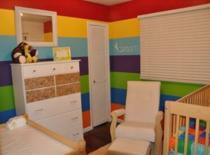 Paint a checkered flag on either side of the wall with your baby's name in between. Paint your favorite team flag and replace the team name with your baby's. Paint a large baseball or football and paint your baby's name across it as if it had been signed there by a famous player. Hollow out old balls and hang them on the ends of your curtain rods as finials. Buy a real ball and sign it with your baby's name. Hang team shirts and caps from knobs on the wall. Drill holes through an old bat, thread wiring through it and turn it into a lamp stand. Create your own belly cast and decorate it like a soccer or baseball. A great idea for a more contemporary nursery is to paint your sports memorabilia, like balls and caps, all the same color as silhouettes. You can do this in almost any color. And last but not least, make sure you include some storybooks about sporting greats on the bookshelf. Share the glory days with your baby while you curl up on the couch together.